SNAFU! : Tigon 6x6 armoured wheeled vehicle. Tigon 6x6 armoured wheeled vehicle. Hanwha Defense Systems selected DSA 2018 in Kuala Lumpur as the location to unveil its new Tigon 6x6 armoured wheeled vehicle. In fact, soon after the exhibition, the giant South Korean defence conglomerate will be conducting a fortnight-long trial with the Malaysian Army for this new-generation vehicle. The Tigon is a successor to the Black Fox, which was developed by Doosan DST, and which was acquired by the Indonesian Army. Four different weapon systems are currently on offer for the Tigon: a crew-served 12.7mm machine gun, and three types of RWS ranging from 12.7mm machine gun to 30mm cannon to 90mm gun. The vehicle’s weight varies from 21t to 22t depending on what weapon is selected. 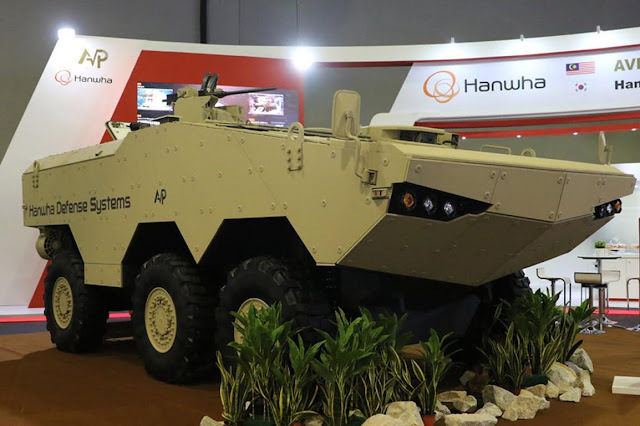 The actual vehicle that will be used for the trials was exhibited on a stand belonging to AVP Engineering, a Malaysian company that has partnered with Hanwha for a number of years. AVP Engineering specialises in vehicle products. For example, it is currently fulfilling a contract to outfit 500 ambulances based on Toyota chassis for Malaysia’s Ministry of Health, and it has previously supplied Ford F550-based ambulance bodies to the MoD. The Tigon has a crew of two and it can carry up to nine passengers in the rear compartment. Able to operate at ranges of up to 1,000km, it features a central tyre inflation system. A 525hp Caterpillar C9.3 turbo-diesel engine coupled to an Allison 4500SP six-speed automatic transmission offers a top road speed of 100km/h and a waterborne speed of 8.5km/h via waterjets. However, the amphibious performance is affected by the weapon system and level of ballistic protection selected by the user. The Malaysian Army has long held an ambition for a 6x6 APC, especially for the type of United Nations peacekeeping mission that Malaysia is currently performing in Lebanon. There were once reports connecting the Anoa, a 6x6 APC from PT Pindad in Indonesia, to the Malaysian Army, but such a deal never materialized. Doosan, which was since absorbed by Hanwha, had previously demonstrated the Black Fox to the Malaysian Army. If the Tigon is selected by Malaysia, Hanwha would make the hull and subsystems while AVP Engineering would outfit the interior as part of a transfer of technology agreement. The week preceding DSA 2018, Hanwha exhibited a scale model of the Tigo at DefExpo in India. Ok. Don't know what to say. Definitely want to see it moving, nice looking though.